Heavy duty Rock Breaker for 20 Ton Excavator having very low maintenance . 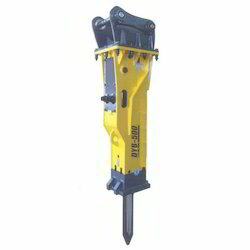 With enriched market experience, we have been able to offer a wide spectrum of Hydraulic Rock Breaker. Renowned among the leading names, we are engaged in providing Hydraulic Rock Splitter to our valued clients at very reasonable price. 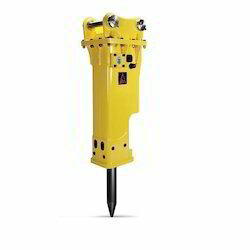 Hole Size Required: 1 3/16", 1 3/4, 1 3/4"
Minimum Hole Depth(inch): 18", 26", 12, 12", 39"
We are offering SB Hydraulic Rock Breaker to our clients. With our in-depth knowledge and experience, we are actively engaged in offering Hydraulic Rock Breaker. With our in-depth knowledge and experience, we are actively engaged in offering Hydraulic Rock Breaker. Our offered hydraulic rock breakers are available from us on numerous specifications to choose from. The ROXAR ( Eurostar) rock breaker is a European Product manufactured in France and the technology one of the best in the available range. - Full range for 2-60 ton excavators. - Time Tested and proven design and technology. Since we have developed our base in this business realm, we have been immersed in delivering best-in-class Bush Hydraulic Breaker.